Sketch out your design on the back of the card. 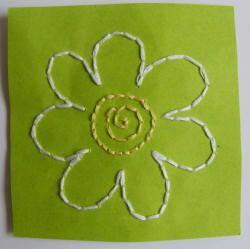 Put the card on a folded newspaper, and, following the outline that you have drawn, punch holes with your needle. Try to space them evenly. Tape one end of the thread to the back of the card to secure, and sew your design in place. 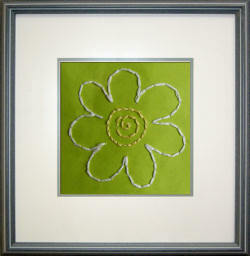 Either frame the picture for a special gift, or glue your daisy to the front of a card for a spring birthday, Mothers Day or Teacher Appreciation week card.